“Don’t be ridiculous, we’ll never buy a place in Thailand.” That was my emphatic reply, when my partner Karen tried to persuade me to check out the demo suite in the building under construction next to our vacation hotel. We were on the typical first-time visitor’s itinerary to Thailand—one week on the beach, one week in Bangkok, and one week in Chiang Mai. We stayed at The Aspasia, an apartment/hotel perched on a cliff. The plan was that we’d venture out and explore other Phuket Island beaches after three days, but we loved our place high above Kata Beach and extended our stay. However, once we were back home in Alberto, Canada all it took was a slight hesitation at the question of, “How about that condo now?”…and we weren’t just looking at the show suite—we were its proud new owners. For $200,000 we bought a furnished 1,100-square-foot condo with views of the Andaman Sea in a five-star complex with full-time staff—we know we would never buy beachfront property for that price in North America. Technically, foreigners are unable to purchase land in Thailand, so what we bought was our property, with a 30-year lease from a company that we in turn became part-owners of. A loophole that allows us to own the condo freehold. It took us two years before we finally made the trip to see our new home—it was placed in the hotel rental pool in the interim. We sold our business and applied for a three-month visa, ready to try out our new Thai life. Our plan is to make annual pilgrimages during the cold Canadian winters, and then spend more and more time there in the future. 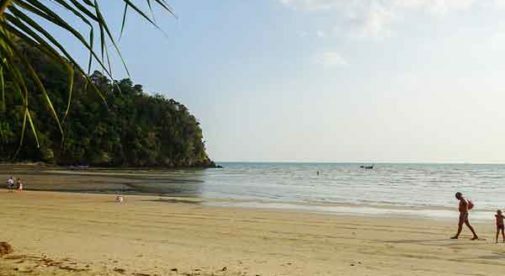 Kata Beach is near the south end of Phuket and is protected by Pu Island, keeping the waters calm and perfect for snorkelingsnorkeling just off the shore. The powder-sand beach is separated from town for most of its length by a quiet resort. The town itself is lively with shopping stalls, restaurants, and tourist attractions, but the steep Laem Sai road leads us to our home a quiet oasis; away from the tourism and traffic. 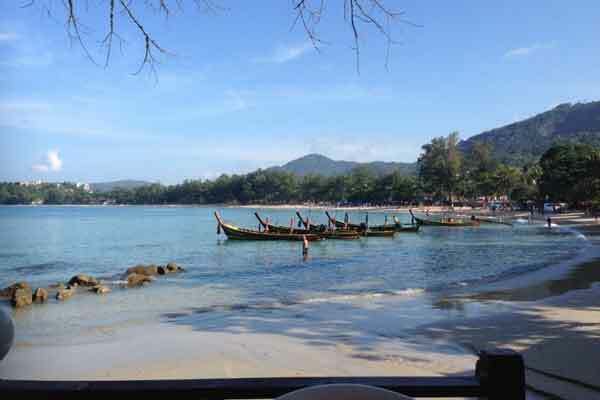 We are fortunate to enjoy an array of delicious and authentic Thai food for two at local waterfront restaurants for $10 to $15 (no drinks) before strolling home along the beach. Relaxing on the deck, watching the boat lights, and listening to the sounds of the night jungle, we don’t second guess our “show suite home in a tropical paradise” decision.